Part of our Thanksgiving morning ritual for years included my first born son and me wandering into the kitchen very early to begin the process of preparing Thanksgiving dinner. While the rest of our household slept, I rinsed, dried, seasoned and stuffed the turkey as I prepared it for the oven. Meanwhile, my number one son would sit on a chair in front of the trash can peeling potatoes for the mashed potatoes. I would always finish prepping the turkey and have it in the oven before he finished peeling potatoes, and we would finish the job together. I don’t know if anyone else has made this observation, but children tend to grow up. As they grow up, their bodies mature, and their coordination improves. I had apparently not made this observation, or I didn’t take it into account. This oversight had some significant consequences one year. One Thanksgiving morning, I hadn’t even gotten the turkey stuffed before my son proclaimed that he was finished. I turned around half anticipating that he was tired of peeling, but he was really finished. He had peeled an entire 10 pound bag of potatoes and had filled the pot and created a pyramid of peeled potatoes on top of it that stacked three times higher than the rim of the pot. I was actually impressed by his ability to stack the potatoes so high. My kids are older, and not every one still lives at home. Baker’s Man has never been a big fan of mashed potatoes. I like them sometimes, and other times, I don’t want to see them. Mashed potatoes, however, are an expected side dish for Thanksgiving. They have to show up for the main event, or there will be mutiny. Leftovers are another matter. I worry that we will not make it through all of the leftovers before they go bad and by now, you know how I feel about food waste. Last year, the mashed potatoes didn’t seem to be disappearing fast enough, so I was compelled to create a recipe that would serve as a vehicle to finish them off. The result was the mashed potato pancake. The announcement of the recipe was met with a lack of enthusiasm, but the final result was praised. Baker’s Man claimed that they tasted like crispy loaded baked potato cakes. He liked them. I took that as a good sign. We will definitely have them again. These are a great snack to serve while watching the game, and go well with BBQ Turkey Sandwiches, too. The recipe is below. Give it a try and let me know what you think. If you’re looking for ways to use up leftover Thanksgiving turkey, Check out last year’s post about turkey sandwiches. 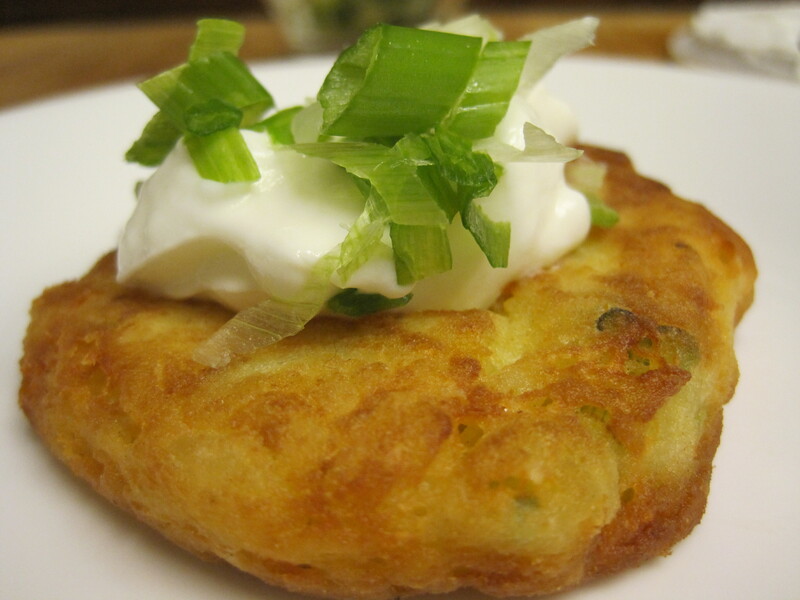 Leftover mashed potatoes are turned into a potato pancake that is reminiscent of a fully loaded baked potato or twice baked potatoes except these delicious morsels are covered with a crispy crust. ¼-1/2 cup olive or vegetable oil for frying. Add ¼ cup flour, a little at a time, stopping when the mixture is stiff enough to be rolled into a ball. (You may need a more or less flour depending upon the original consistency of your mashed potatoes.) You want the ball to roll into a ball that you can roll and smash into a disk without it falling apart in your hands. Pour the second quarter cup of flour onto a small plate. Roll potato mixture into 1½ to 2 inch balls. Flatten ball into ½ inch thick disk. Dredge disks of potato mixture in the flour that is on the plate. 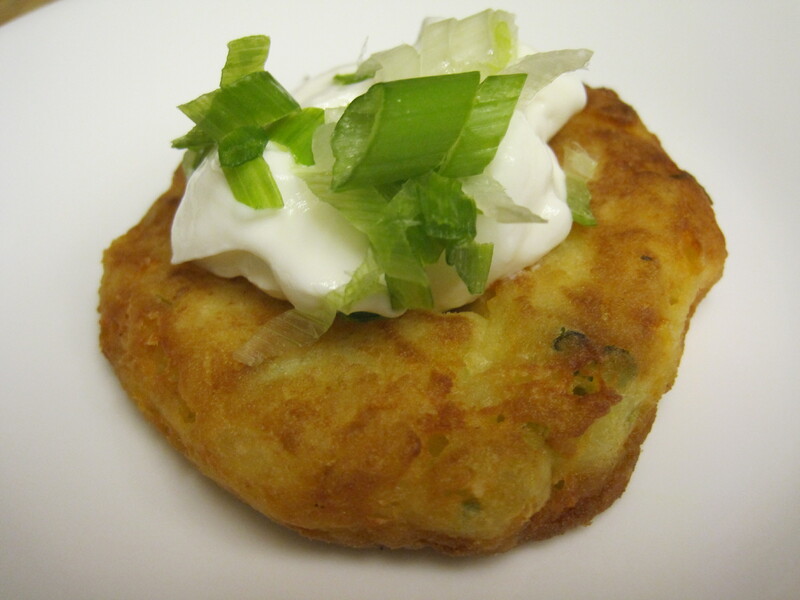 Serve with a dollop of sour cream and additional sliced green onions. Helpful Hint: You can keep the first pancakes that are fried warm and ready to serve by putting them on a metal cookie cooling rack over a baking pan in a 220 degree oven until ready to serve.